Thursday 28th September marked National Poetry Day, a day when schools and other organisations come together to recite, write and celebrate all kinds of poetry. 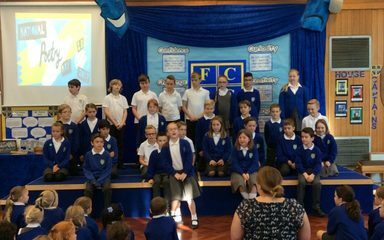 At Fellside, we celebrated by reciting some of our favourite poems to each other in a special assembly. It was wonderful to hear such a range from Reception to Year 6 and we certainly will try to remember our own poems for years to come. It is always enjoyable to celebrate National Poetry Day and this year was no exception. It’s a super skill to memorise and recite poetry and I was so very proud of all of the children’s performances.